You could receive 100 Points Points on your birthday. You guys are on to something!!!! The lemon lime should be called salted margarita. Delicious. Not so dang sweet as every other drink. I sweat a ton of salt and this mix prevents cramps. I’m a convert. The shots go down easy and taste great. Will be buying only EFS shots and sports drinks in perpetuity. Thanks for doing what you do! I absolutely love the the EFS Drink Mix. I used it for all of my races and strenuous training rides/workouts and I never experience muscle cramping or dehydration. The lemon/lime flavor is my favorite, but the fruit punch flavor is great too! Great stuff good flavor but not super sweet and works really well on long hot training days! Best on market for all around performance. Been using EFS for over 7 years. Tired others along the way, but none have ever met the performance of EFS. The EFS product information is accurate and consistent, and other suppliers have not met this standard. EFS drinks provide an ideal blend of simple and complex carbohydrates, amino acids, antioxidants and electrolytes you require to fuel working muscles and increase endurance during exercise. You’ll notice the difference right away too. With the latest amino acid technology, superior mineral bioavailability and the addition of Malic Acid, EFS drinks refuel working muscles faster than ever before. They taste great, not chalky or overpoweringly sweet. And with the highest electrolyte content available (1160mg of all 5 electrolytes/serving), there’s no need to carry those extra electrolyte pills or add anything else. Plus, EFS doesn’t contain Vitamin C because the latest research shows that Vitamin C can have a negative effect on endurance and performance when consumed during exercise. Clinical research shows endurance athletes require much higher levels of electrolytes than most sports drinks provide to prevent cramping and dehydration. 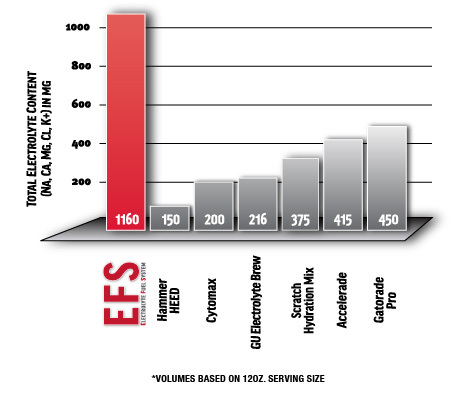 EFS drinks deliver over 1,160mg of all 5 electrolytes per serving, more than any electrolyte drink on the market. EFS formulas utilize two unique sources of calcium and magnesium. DiCalcium malate and Dimagnesium malate have superior bioavailability compared to other mineral sources. In a bioavailability study, absorption rates were between 20% and 100% higher using DiCalcium and DiMagnesium malates. Malic acid stimulates oxygen consumption by increasing mitochondrial uptake, improving mitochondrial respiration and increasing energy production. Malic acid is essential in the formation of ATP, the body’s energy source. Malic acid allows the body to make ATP more efficiently, even under low oxygen, or hypoxic conditions. Consuming carbohydrates during prolonged exercise enhances performance by supplying energy for muscles to use when glycogen stores begin to drop. EFS products have been specifically formulated to deliver the ideal blend of complex carbohydrates, glucose (dextrose) and sucrose for energy. Clinical research shows a combination of carbohydrates is better than a single source for the absorption and utilization of blood glucose (Guezennec, C.Y, et.al.). 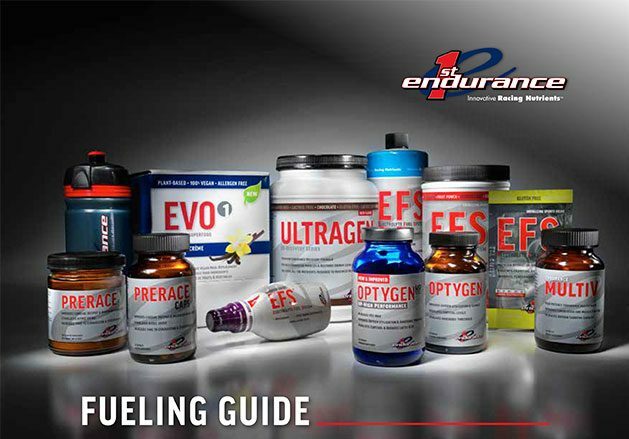 EFS products also provide three different high-glycemic sources of carbohydrates for immediate energy and easy digestion during long and intense workouts. The low osmolality of the EFS energy drink and ideal 7% carbohydrate solution provides superior fluid absorption. Clinical research shows that energy drinks mixed within 6-8% offer the optimal absorption of both carbohydrates and fluid for endurance racing and training (Shi, K et al.). The biochemical structure of the carbohydrate, the absorption process, the size of the food particle, the degree of processing, the contents and timing of the previous meal, and the co-ingestion of fat, fiber, or protein affect the absorption of a carbohydrate as well as its glycemic index (GI). The ability to rapidly replenish carbohydrates after training, and the ability to consume and convert ingested carbohydrates into a usable form of carbohydrate, is important in allowing you to train and compete at your best. Ingestion of the wrong carbohydrates at the wrong time, or ingesting too little carbohydrate can impair performance both in the short term and long term. Consuming a slowly digested carbohydrate during times where the body is at or above threshold can lead to disaster. During times where you exercise or race at and above your threshold, your blood circulation is focused on the working muscles and away from the stomach. This makes digestion of foods difficult. In fact, consuming a slowly absorbed sugar during these times will slow gastric emptying (the emptying of fluids and foods from the stomach to the blood stream) and in essence block fluids from being absorbed. This can actually cause dehydration. The EFS drink formula uses two unique patented sources of calcium and magnesium as amino acid malates. DiCalcium malate and DiMagnesium malate have superior bioavailability over other calcium sources. DiCalcium malate in a bioavailability study proved to be absorbed significantly better and remained elevated from time 0 to 12 hours, representing a more absorbable form for a longer period. Absorption rates were between 20% and 100% higher using DiCalcium and DiMagnesium Malate. Furthermore, these superior minerals also offer a buffering of stomach acids. DiCalcium malate and DiMagnesium Malate lower stomach acids significantly, helping to reduce the unwanted gastric distress that can be associated with other minerals. Endurance athletes have different fluid and electrolyte needs, particularly during longer and higher intensity training sessions and competition. The increased loss of sweat translates into an increased loss of electrolytes, and, as previously mentioned, sodium is one of the important electrolytes that must be replaced during exercise to prevent dehydration and hyponatremia. The composition of standard sport drinks may not provide an adequate amount of electrolytes during activity lasting longer than two hours. Most standard sports drinks contain 50- 110 mg (200-460 mg/liter) of sodium per 8 oz. Because we are limited on the amount of fluid the body can absorb by the intestines, it may be important to consume a higher amount of sodium during exercise to minimize fluid loss. The body can tolerate a higher sodium intake (closer to the amount lost in sweat) and it does not appear to negatively affect carbohydrate absorption. Ingredients: Complex carbohydrates, sucrose, dextrose, AjiPure Amino Acid Blend (L-Glutamine, Leucine, Iso-Leucine, Valine), Electrolyte blend (chloride, sodium, potassium, magnesium, calcium), citric acid, natural flavors. Q: What’s the difference between EFS and EFS-PRO? A: Nutritionally, cramping stems from electrolyte imbalance, electrolyte depletion and/or dehydration. EFS provides the most potent electrolyte profile available. The combination of all five electrolytes delivers a potent 1160mg per serving, helping to prevent cramping. The 300mg sodium per serving also aids in maximum fluid absorption so you stay hydrated throughout your training and racing. Supplementing with additional salt tabs, electrolyte tabs, or salty snacks is no longer needed when using EFS. Q: Why do EFS Drinks contain malic acid? A: Malic acid stimulates oxygen consumption by increasing mitochondrial uptake, improving mitochondrial respiration and increasing energy production. Malic acid is essential in the formation of ATP, the body’s energy source. Malic acid allows the body to make ATP more efficiently, even under low oxygen, or hypoxic conditions. 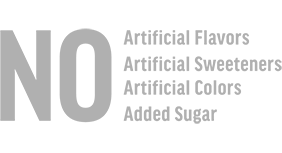 During anaerobic conditions, malic acid has an ability to remove the accumulation of reducing equivalents. Human studies have shown that after endurance training, athletes’ muscles were characterized by a 50% increase in the malate-aspartate redox shuttle enzymes. A: EFS contains 2g free form amino acids per serving which is the equivalent in BCAA and glutamine profile to 9g whey protein. 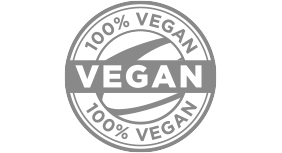 Protein naturally contains BCAAs and glutamine. Clinical evidence supporting the use of BCAAs and glutamine during exercise dates back to 1991. These clinical studies clearly indicate supplementing with as little as 1g free form amino acids improved performance, reduced post-exercise muscle damage, improved muscle glycogen resynthesis, reduced central fatigue and improved rate of perceived exertion. These are the same claims made by the most recent protein study and clearly support a mechanism for improved performance. In addition to the clinical support, other factors lead to a decision to use these free form amino acids over complete proteins. A: Clinical research shows that a 6-8% solution delivering between 45-60g carbohydrates, >1000mg amino acids, 400-600mg sodium and equivalent balance in all electrolytes should be taken every hour during exercise. Athletes should consume one serving for every 30 minutes of intense exercise. Adjustments should be made based on body weight, training state, heat, individual sweat rates and preference. Use one serving for every 30 minutes as a starting point and adjust as necessary from there. Additional calories and electrolytes can be added with EFS liquid shots.